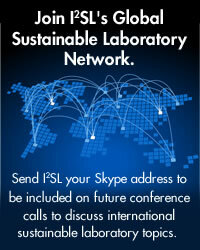 I2SL invites you to take part in advancing sustainability objectives in laboratories and related high-tech buildings. Our newest endeavor, "Building Information Modeling (BIM) for High Tech Facility Life-Cycles," involves organizing three working group committees that will address issues specific to the application of BIM for facility operations and maintenance (O&M). Read the article below to learn more about BIM and how to take part in these committees. I2SL also wants you to know that college and university faculty can now register their students for the International Sustainable Laboratory Student Design Competition! I2SL seeks judges for the competition and encourages the I2SL Community to provide recommendations. Judges will be recognized for their efforts and expertise in selecting the student winners at the Labs21 2012 Annual Conference. The competition jury will be established by May, and judging will occur this summer. Contact me if you are interested in being a judge. The Labs21 2012 Call for Presenters is now open and ready to receive your abstract submissions. I2SL seeks abstracts on a range of laboratory and high-tech facility topics, including, but not limited to: sustainability retrofits, lessons learned from third-party financing projects, BIM applications, useful skills for O&M professionals, sustainable design strategies, getting the most sustainability out of a limited project budget, and carbon neutral campus planning. Speakers receive several benefits for their participation. 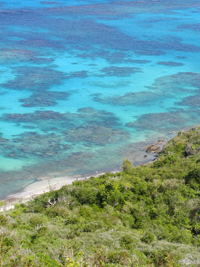 Read more about the Labs21 2012 Annual Conference Call for Presenters. Next week, the Labs21 Annual Conference planners will travel to Northern California, where we will meet with many of the region's laboratory owners and operators, architecture and engineering firms, universities, and utilities as part of our planning for the event. We will also visit several possible tour locations in and around San Jose. Please contact I2SL to request a meeting with the conference planners during this visit. Many thanks to the 2012 Conference Planning Committee for your suggestions and helpful feedback in advance of this trip! This year's conference is expected to draw more than 700 of the high-tech building industry's best and brightest to Silicon Valley—the heart of American innovation. What better forum to share your cutting-edge, sustainable building technologies and ideas? Conference speakers have the opportunity to share their in-depth knowledge and experience with industry leaders and peers from around the world, receive a discounted registration fee, and potentially have their work published and shared beyond the conference. 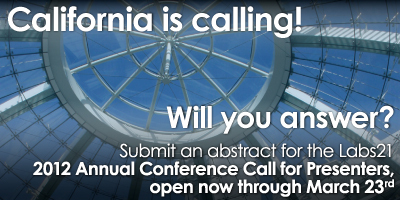 Be sure to submit your abstract to the Labs21 2012 Annual Conference Call for Presenters before the March 23 deadline so you do not miss out on this opportunity. There's no time like the present to sign up for a booth in the Labs21 Technology and Services Fair! With fewer than eight months remaining until the conference, the hall is already nearly a third full, and prime booth spaces are going fast. Exhibitor prices go up after June 1, so save by registering today. Technology Demonstrations have become a mainstay of the Labs21 Annual Conference Technology and Services Fair. Here, vendors are able to demonstrate products that support the objectives of sustainable O&M in laboratories and related high-tech facilities. Learn more about this unique opportunity or submit your Technology Demonstration abstract through the Call for Presenters. You can make a lasting impact on Labs21 2012 Annual Conference attendees by becoming a conference sponsor. Opportunities start at just $500, and sponsorship just became easier with a new online form that will process your sponsorship quickly and efficiently. 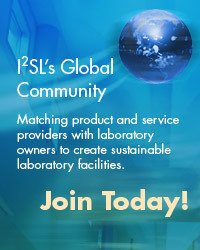 Gain global exposure to hundreds of attendees and thousands of I2SL community members, demonstrate your company's commitment to sustainability, and show your support for the Labs21 2012 Annual Conference by becoming a sponsor today. Curious about sponsorship? Visit I2SL's website to learn more. Remember, sponsorship of I2SL activities can be tax deductible. I2SL thanks returning sponsors Integral Group, Starline Plug-In Raceway, and New-Tech for their support! Join these companies in sponsoring the conference. Sponsor early to maximize your exposure to our targeted audience! Do You Know What it Takes to Go Beyond? I2SL is looking for a few good judges to serve on the Go Beyond Awards Evaluation Committee. During the summer, the judges will provide feedback on the merit of this year's Go Beyond Awards nominations to determine this year's winners. Would you like to serve in this important role? We are looking for one architect, one owner, and one commissioning agent to join our committee. If you are interested, please contact I2SL. Registration for both webinars will open soon, so check back to I2SL's website for updates. Did you miss I2SL's latest High-Tech Talk, Make the Labs21 Tool Kit Your Most Valuable (Free) Design Tool? If so, you're in luck! A recording of the webinar is now available for viewing online. Learn about the resources the Labs21 Tool Kit has to offer and how you can use them successfully. Register online to gain access to the webinar. If your company has a new money-saving tool or gadget to share with I2SL's Community, then we want to hear from you! The I2SL High-Tech Talks Webinar Series is now seeking speakers who would like to put themselves in front of an engaged audience for these hour-long webinar sessions. Please contact I2SL if you're interested in this opportunity. 2011 Go Beyond Award winner. The California Institute of Technology (Caltech) was honored with the 2011 Innovative Technology and Systems Go Beyond Award. Several initiatives at Caltech, including a Greenhouse Gas Mitigation Plan, the Energy Conservation Investment Program, and the aggressive Caltech Retro-Commissioning Program, are working together to help the university reduce energy use and greenhouse gas emissions. Caltech's energy conservation and renewable energy generation projects complement each other to maximize Caltech's greenhouse gas emission reductions. This synergy is illustrated perfectly by Caltech's three LEED® Gold certified laboratories, all of which achieve at least a 20 percent reduction in energy use, with two hosting rooftop photovoltaic arrays. The marquee project is the Linde + Robinson Laboratory, which brings together concentrated solar photovoltaics and fuel cells to power the nation's first LEED Platinum certified laboratory in a historic building. 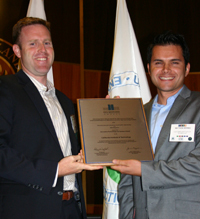 I2SL congratulates Caltech on its Go Beyond Award and all its sustainability efforts. Keep up the good work! Have you considered how BIM could help owners manage their laboratories or related high-tech facilities? If so, you should consider getting involved in I2SL's BIM Working Group Committees, which are helping to drive the capabilities available through this technology. BIM is an interactive tool with the potential to provide a robust and accurate description of your facility. It offers a much more user-friendly, three-dimensional view of the facility as a whole, and allows users to look at all of its interacting parts. You can also record any changes to any component and design. For years, BIM has been transforming how the industry designs and constructs high-tech buildings. Now, a new emphasis is being placed on BIM as a facility management and operations tool. BIM is considered a necessity for laboratories and related high-tech facilities, especially for maintaining their energy and environmental objectives. The potential benefits of BIM in complex facility management are numerous. In particular, BIM can be an efficient means of transferring information about the purpose, operational abilities, and maintenance of building elements from the designer to the facility owner. Yet while overall usage of BIM is increasing, it has not reached its full potential in assisting with facility O&M. I2SL has pursued BIM as an O&M tool for laboratory sustainability, with the understanding that BIM would become the owner's manual for the facility (akin to the glove compartment manual found in your car) and would help owners and operators achieve the energy and environmental sustainability goals they have set for their high-tech facilities. As such, I2SL and its key partners, the buildingSMART alliance (bSa) and the International Facility Management Association (IFMA), are working with industry experts to develop a roadmap to utilize BIM as a high-tech facility life-cycle tool. The I2SL, bSa, and IFMA partnership has organized a research framework for BIM and is engaging with industry members to address several key components of the framework. Objective: Create a survey to define the BIM tools that are currently available or in development that can be applied to high-tech facilities, and then identify gaps based on the needs of high-tech facility operators and managers. Objective: Gather information on what BIM services are being offered by designers, design-build firms, and others, plus the value these might provide to owners. Objective: Consider how collected information from these and future committee activities can be made readily available. These committees will generate valuable knowledge to drive the application of BIM as a high-tech facility life-cycle management tool in a productive and informed way. Are you interested in getting involved? Contact I2SL to join future calls and meetings and lend your expertise to this important effort. Would you like more information about BIM, the BIM Working Group Committees, and how implementing BIM can benefit your facility? Then make plans to attend I2SL's April 19 High-Tech Talk Webinar, BIM: The Future for Your High-Tech Facility. Registration for this webinar is coming soon on I2SL's website. The International Sustainable Laboratory Student Design Competition is gaining momentum, with 400 students from 25 universities and five countries already registered. Want to gain global visibility for your company while also helping to support the next generation of high-tech facility designers? Consider aligning yourself with the competition by becoming a Labs21 2012 Annual Conference sponsor. Competition sponsorship opportunities range from financial contributions—such as sponsoring the Opening Plenary Session, where hundreds of high-tech facility professionals will gather to witness the presentation of the competition's awards—to other areas of support, such as offering internships to select winners. Visit I2SL's website for more information on how to sponsor this amazing competition. I2SL will participate in this event. 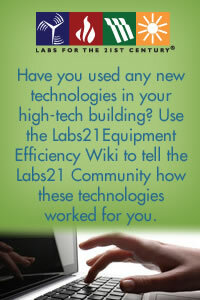 Did you know you can comment on the products in or add new equipment to the Labs21 Equipment Efficiency Wiki? Use the wiki now. Beth Shearer, Beth Shearer and Associates, Inc.
I2SL is the official cosponsor of the Laboratories for the 21st Century (Labs21®) 2011 and 2012 Annual Conferences and Workshops with the U.S. Environmental Protection Agency and the U.S. Department of Energy. I2SL is proud to recognize buildingSMART alliance, EGNATON, The MAITE Foundation, International Facility Management Association (IFMA), and R&D Magazine as its partners. Phil Wirdzek, I2SL • Gordon Sharp, Aircuity, Inc. • Beth Shearer, Beth Shearer and Associates, Inc.
Franco Atassi, Siemens Industry, Inc., Building Technology Division • Robert Blakey, CB Richard Ellis, Inc.
with "unsubscribe" in the subject line.